This was a popular article on our prior blog, so I wanted to incorporate it on our redesigned blog. During one week in 2013, we had two repair jobs for Square D I-Line bus duct. One job was a repair for a section of AP510 (aluminum, 1000-amp, 4-wire, plug-in). This busway section is an older style of Square D bus duct, the I-Line I series. The second job was for a couple of sections of AP2312G (aluminum, 1200-amp, 3-wire, plug-in). This bus duct is Square D's current I-Line II bus duct series. The older Square D I-Line duct shown above has channels where the bus bar runs through the housing. The channels can be spotted by the bubbles extruding along the housing side. One end of the duct is a slot end (facing the camera) and the other is a bolt end. When adding a tap box to higher amperage Square D I-Line bus duct, you need to know which end of the duct you are adding on. (The tap box has to mate with the other end). 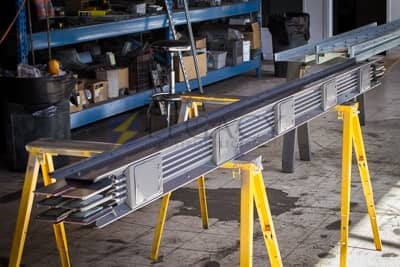 The newer I-Line II bus duct pictured above is a sandwich style bus, where the bus bars are "sandwiched" together in the housing, laying on top of each other. Mylar insulation wraps around the bus bar keeping the phases insulated from each other and the housing. 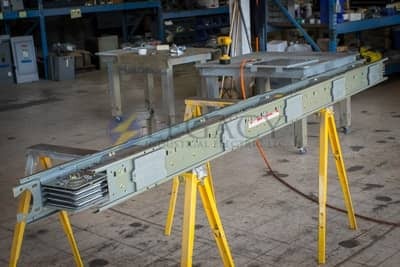 The I-Line II bus duct uses a "joint stack" to connect the sections. The joint stack is shown on the above image. The joint stack can be assembled onto either end. One thing to watch is that you need the joint stack to connect the sections. Without the joint stack, the duct section is a mammoth paperweight. The I-Line II bus duct is offered from Square D for 800-amp and higher. The I-Line I bus duct is still offered by Square D, but only for 225-amp, 400-amp, and 600-amp. The catalog number provides a clue, as to which series of bus duct. I-Line II series bus duct has a "2" in the catalog number. If you have the older I-Line I and want to extend the bus duct run, there are a couple of options. One is to contact Square D or a secondary market for a transition piece. The transition section would have one end of I-Line I and one end of I-Line II. We do come across them. Another option is that we can custom build a transition box, with one end of the box is the older I-Line I and one end of the box is the newer I-Line II. One of the features that makes Square D a great choice is that Square D I-Line bus plugs fit the I-Line I and II bus duct. Even if you have a run of obsolete 1200-amp I-Line bus duct, Square D's current bus plugs will work. And, when you add on a new I-Line II run for your expanded manufacturing, the extra bus plugs on your shelf for the older I-Line I run are going to work on the new run.